Roman unit standards played a important role, both ceremonially and on the battlefield. With the armies of the late Roman Republic and early Empire continually engaged on the frontiers, the soldiers selected for the dangerous honor of carrying them were figures of particular renown and splendor. 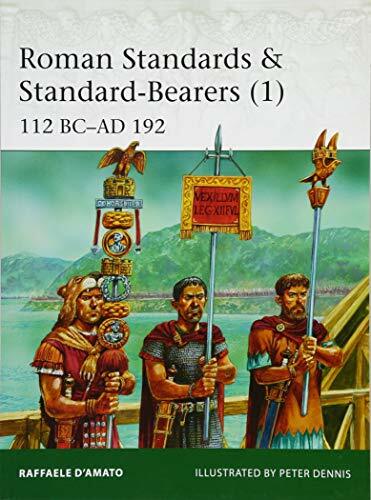 Standard-bearers wore special armor, with the heads and pelts of animals such as bears, wolves, or even lions draped over their helmets and shoulders. The standards themselves varied greatly, from the legion's Eagle and imperial portrait image to various cohort signa, flags (vexilla), and even dragon "windsocks" (dracones) copied from barbarian enemies and allies. This first volume of a two-part series by Roman army expert, Raffaele D'Amato uses detailed color plates and the latest research to examine these vital cogs in the Roman army machine that drove its soldiers to conquer the known world.